We believe that anyone can become employed if they are motivated, given the right job and the right support. Supported Employment is a flexible and continuous process, designed to make that happen. BASE members regard employers as key customers of their services and there is a strong business case for employing a diverse workforce as many companies have discovered. 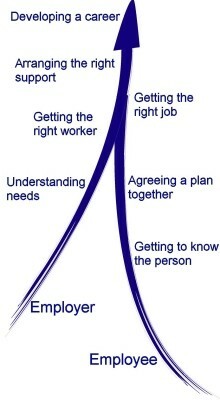 The model is equally applicable to supporting job retention. Many potential jobseekers are using traditional day services or receiving support from health and social care agencies. Our members maintain close links with referring agencies and seek to encourage people to explore employment as a way of improving their quality of life. The first element of a successful job match is the vocational profiling or "getting to know you" process. Here we identify the aspirations, learning needs, individual skills, past experiences and job interests of the jobseeker. Working with families and support workers, we gather the information needed to develop a good job match. We look to identify the ideal job for that person based on their skills and preferences. Many people have never worked or not worked for many years and may need support to make informed choices about career opportunities. Many employers are anxious about employing someone with a significant disability but there’s nothing special about it. Once they’ve tried it out they often become very committed to helping people overcome traditional recruitment and selection barriers. We know that traditional recruitment techniques can be overly rigid and formal interviews seldom result in offers of employment. Our members often use "working interviews" which allow individuals to demonstrate their skills in the workplace and allow the employer to gather the sort of evidence that a formal interview seeks to capture. Generally, our aim is to ‘place and train' rather than 'train then place’. This means that a participant gets a job from the beginning. We know that most people learn skills better in situ rather than in artificial environments. By doing this we overcome the "job readiness" obstruction where people can get stuck in permanent training. It also increases people's motivation significantly because they see from the beginning that they are employed. A job analysis is usually undertaken to checks out any assumptions made in the job description. Although it is common practice for employers to set out the basics of a job for new recruits, it is not common for a detailed analysis of the job and environment to be available. We look at all aspects of the job and the work place, including health and safety, to make sure we have the right job for the right candidate. Our members will discuss whether extra assistance or alterations to working practice or the environment are needed. This helps to produce a better job match. The job analysis might point towards ways of carving together parts of job descriptions that suit the workers' talents, or creating new job descriptions that suit the worker and are cost effective for the employer. Most adjustments are reasonable and inexpensive. It is important to offer appropriate levels of support and encourage the involvement of the employer and co-workers. BASE members can support the person’s induction and provide on-site training support where needed. They may also offer out of work support if needed. Individual development plans are usually used to plan and monitor the employee’s learning. Targets should include encouraging the social inclusion of the worker within the workplace. We identify the most 'natural' ways in which we can support people with disabilities in employment, working in partnership with employers and all concerned. More intensive and personalised approaches such as Training in Systematic Instruction are available if needed. Not all workers will reach the productivity, quality and social standards set by the employer. When all learning strategies have been exhausted and the data shows no further improvement, discussions will be needed to seek a more suitable job match with the employer or to find a different job with a different employer. Not many people stay in the same job for the whole of their working lives and people with disabilities are no different in having to adapt to changing labour markets and wanting to improve their working lives. Supported employment should encourage the career development of individuals by promoting training opportunities and seeking options for increased responsibility.